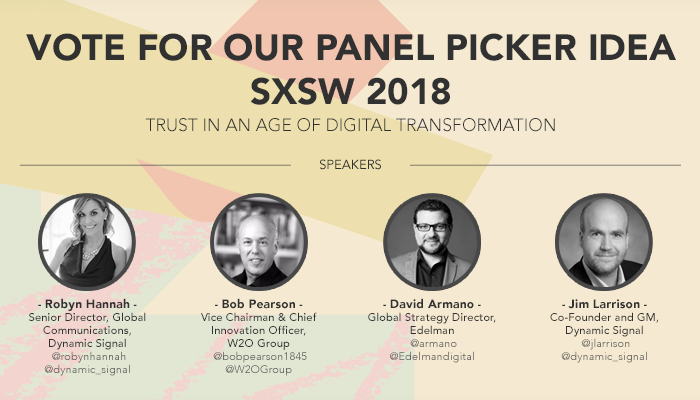 Trust, Digital Transformation, and SXSW – it’s all here! It’s that time of year when your entire social feed is being dominated by images of the SXSW Panel Picker and a very clear, albeit kinda yelly, CTA to VOTE NOW!!! And while we promise to avoid all-caps and excessive exclamation points, we’re joining the ranks, and enlisting your help. Together with agency powerhouses Edelman and W2O Group, the Dynamic Signal team has put together a hard-hitting, data-driven, panel discussion about the challenges we know are top of mind for today’s Marketing, PR, and Communication professionals: Trust in an Age of Digital Transformation. We’re excited to take this topic to the big stage at SXSW and we’d love your help in making it happen. Head over to the official Panel Picker and let your voice be heard.